Resources :: Great War Dundee - This is the story of the 30,490 men that left Dundee to fight in the First World War and of the people left at home. Click image to preview more. Opens in a new tab. 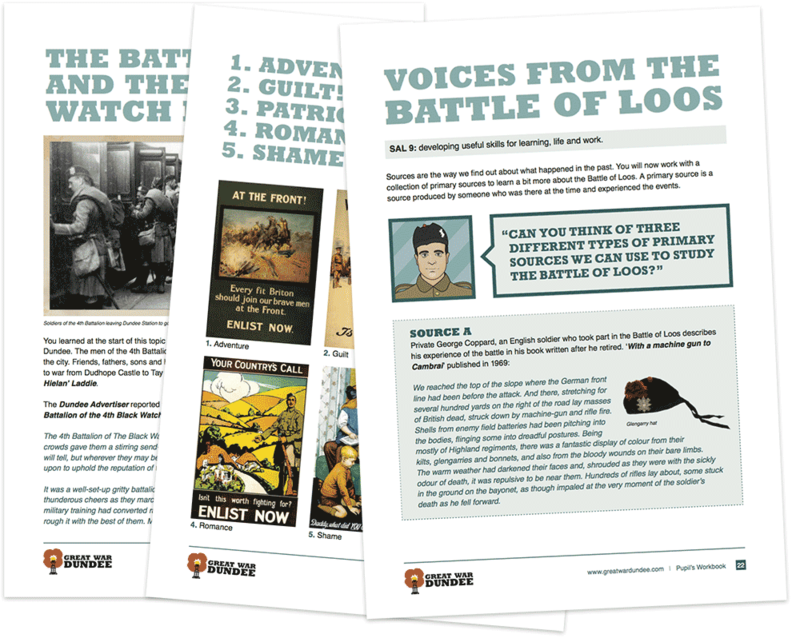 Great War Dundee worked with teachers and Education Scotland to create this FREE education pack designed to support and encourage teachers when teaching the First World War to S2-S3 pupils. The lessons are delivered with the help of Lance Corporal Joseph Lee, the celebrated Dundee war poet and artist. The pack contains an introductory lesson and 5 further lessons on the subjects of: recruitment, conscientious objectors, the jute industry, living conditions and the Battle of Loos. The pack is set in the context of what life was like in Dundee at the time of WW1. Materials include a teacher’s guide, a pupil’s workbook, presentations and accompanying material. 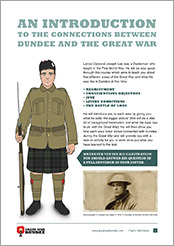 Please download ALL of the following to complete your Great War Dundee teaching pack.